Spray 9-inch square pan with cooking spray. In 3-quart saucepan, melt butter over low heat. Add marshmallows; cook and stir until completely melted. Remove from heat. Stir in hazelnut spread until blended. Add cereal; stir until well coated. Using buttered spatula or sheet of parchment paper, evenly press mixture in pan. Cool completely, about 45 minutes. For bars, cut into 4 rows by 3 rows. 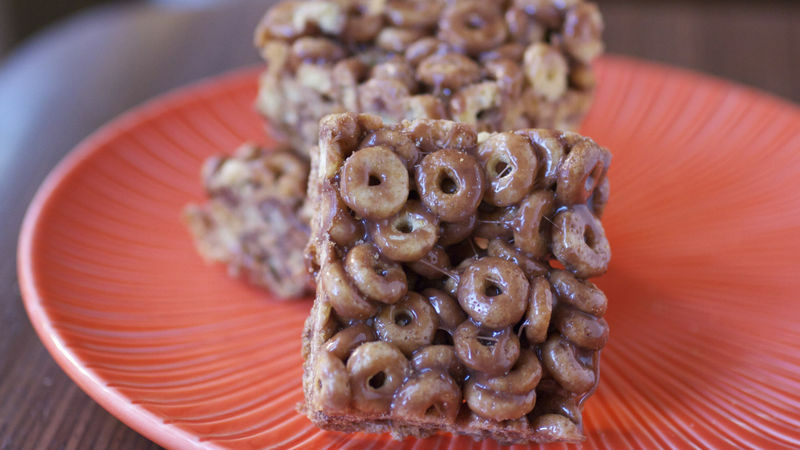 You can substitute original Cheerios® cereal for the dulce de leche variety. Line the pan with parchment paper for easy pan removal.